The official follow-up to the X-Deck! When the farmers are done with their daily tasks and gather round the warmth of their hearth, stories are told of revenants and werewolves, unicorns, witches, faieries and other creatures of the wood. Ahd those who have to go itno the forest the next day to fell some trees might remember soem of the old stories... and shudder. LegenDAIRY? 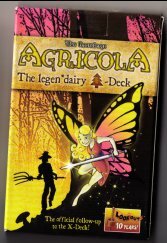 Agricola designers kind of went insane with their deck designs... like the alien abductions edition or this German fairy folk deck. I don't know what they were thinking, but for $3 this is a fun little deck that tweaks the game rules as you play... it's definitely amusing, fun, and ought to be picked up by any fan!